Farmhouse with pool recently renew, divided in six apartments from 2 to 6 beds. Located in the picturesque hills of Pisa, surrounded by greenery and surrounded by vineyards and olive groves, is a perfect starting point for day trips to major cities of Tuscany (Pisa, Florence, Volterra, San Gimignano, Siena) rich in cultural events and artistic beauty. And with no more than 40 minutes by car you can reach the sea where you can swim in the warm waters of the Tyrrhenian Sea and then returned in the evening. 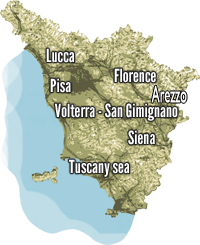 The property is surrounded by medieval villages and small towns as many features as Peccioli Chianni, Volterra, Lari, Buti, where year-round, visit festivals, fairs, pageants and theater performances. PC1041-3/4 (4 people+2) first floor. The apartment comprises a living room with double sofa bed in a fully equipped kitchen, double bedroom with bathroom and shower, double bedroom, bathroom with shower, garden with gazebo, table and chairs. Daily price from €95/apartment min 2 nights.